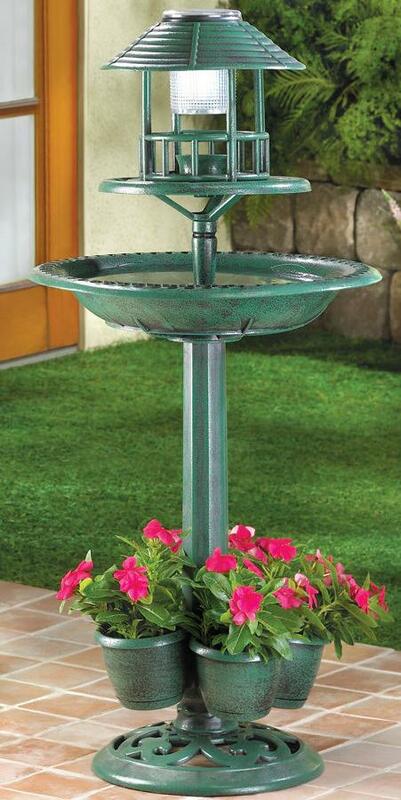 Add this planter birdbath with solar light to add color your patio, deck or your favorite outdoor area. You can watch the birds splash around in the water during the day, then when night falls the solar light will illuminate providing you hours of light at night. This lightweight faux-metal solar birdbath stands approx 36 ½” tall and features a water bowl that is 17” in diameter, four planters for your favorite plants (each planter is 4 ¾” D x 3 ¾” H), and a solar light. Plants not included.